Laissez les bons temps roule! I’m still researching bows for the shamrock piece. Not really, I have researched and have three books marked…just not in the mood to start. Another not really, but I have in my mind how I want the bow to look but don’t know if I can stitch it the same way. In short, I am procrastinating. I have to be in the right mood to tackle some projects, especially those I have a vision of how the finished stitching should look. I want the bow to be realistic looking and the stitching to be very smooth, and full. Do you envision how a canvas should look? 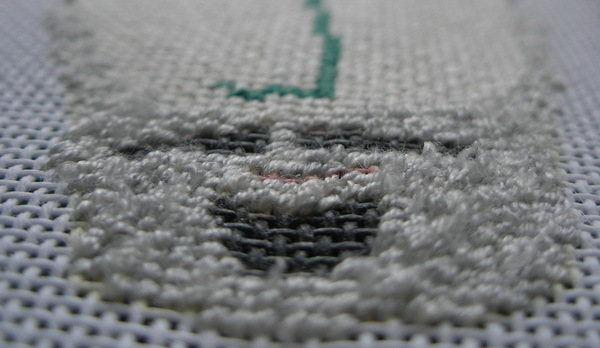 They say that this is why we do not like some of our work; we have envisioned how we think the canvas should look and yet we do not stitch it the same way. I have another month until St Pat’s Day, hope inspiration hits me before then. Bones, the Guild piece from a few posts ago has been passed on. I needed a canvas for Super Bowl…one that was fairly simple and would not require my undivided attention…I think because Super Bowl was in New Orleans I was more attracted to all the activities. New Orleans is one of my favorite cities…but I think it is a young person town. You have to be young to eat, drink and be merry 24/7 for days on end and let’s face it New Orleans is a eat, drink and be merry town! And in my younger days, I could eat, drink and be merry with the best of them, but today I am a little more reserved. I still love the food and I don’t know how you can be unhappy in a town that is always partying, but I have my limits and so fix’n some Cajun food and watching from my “easy” chair was the best “big easy” do this year. Nick was the canvas of choice for Super Bowl and he was fun to stitch. 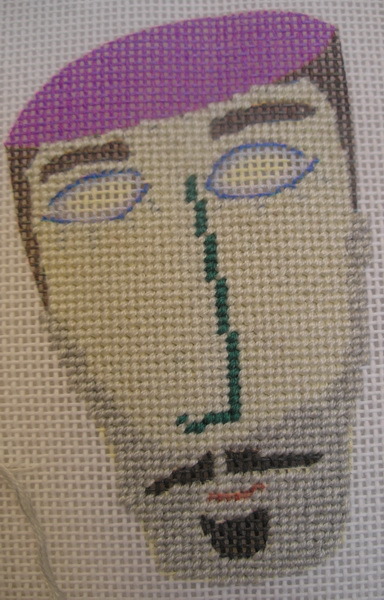 Basketweaved top part of his face with a light green silk floss (remember the colors for Mardi Gras are green, gold and purple). His beard is a loosely stitched basketweave with green and gray silk floss and them I took a needle and ‘fluffed” or picked at the stitches to give him that 5 o’clock shadow look. All of his hair, eyebrows, beard and mustache are Petite Peluche stitched freely in slanted Gobelins. 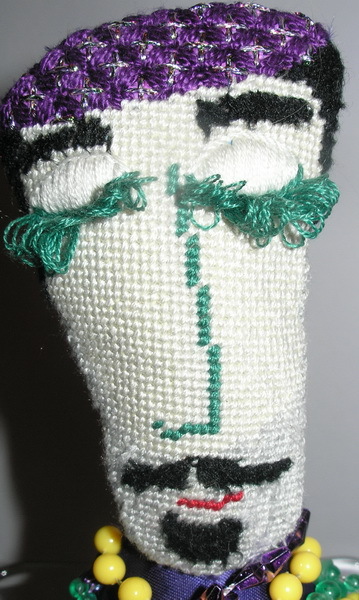 His eyes are padded Satin with an outline stitch and Turkey Tufted eyelashes. I was going to clip the Turkey Tufting but thought it was cute left loopy. He was topped off with a purple beret stitched in a stitch using perle cotton and #12 Kreinik braid: #070: Mardi Gras (http://www.kreinik.com/). 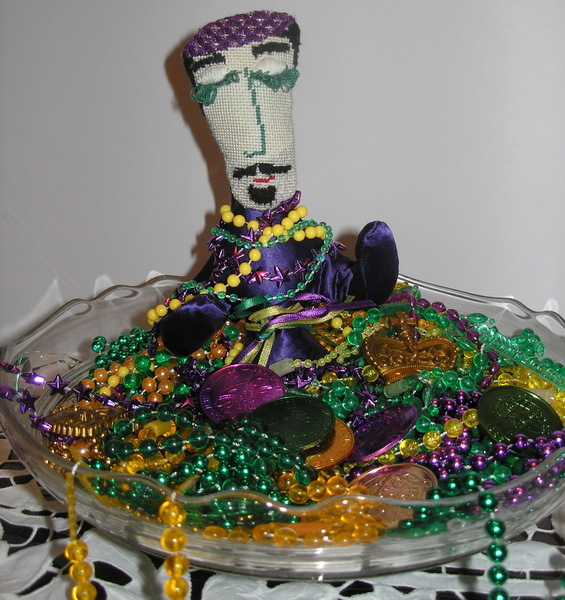 I opened up his body to add a wire frame to give him a spine (you have to have a spine to play at Mardi Gras) so he can play with his beads and doubloons…after all you can never have too much fun at carnival/Mardi Gras. Isn’t he cute? I just love him. He’s been finished and swimming in my from my Carnival/ Mardi Gras days on my desk this past week. 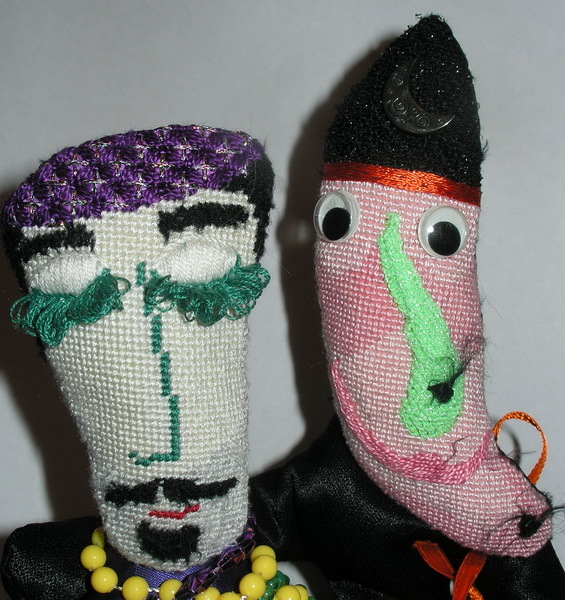 He has a buddy I stitched a long time ago for Halloween. I’m not sure what his real name was (and I don’t see him on the website) but I called him Walter, the wizard witch. I love the doll eyes and I think I added the moon to the hat…But his nose is his crowning glory! 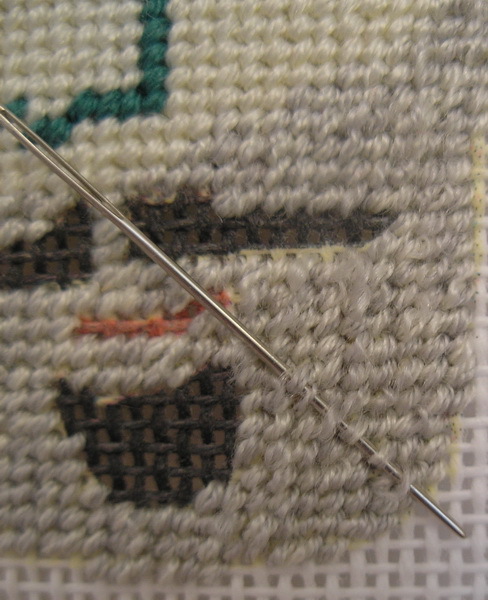 It is needleweaving (buttonhole stitch) over padding using glow in the dark Kreinik braid (http://www.kreinik.com/). And then I made warts using pony beads and Peluche from Fabulous Fibers (http://www.fabulousfibers.com/Default.asp). He also has wire added to him and he usually sits with my other witches at Halloween holding a tiny beanie baby toy from a McDonalds Happy Meal. Thank you for stopping by and I hope you have time to eat, party and stitch today! P.S. This is the rest of my Mardi Gras display. 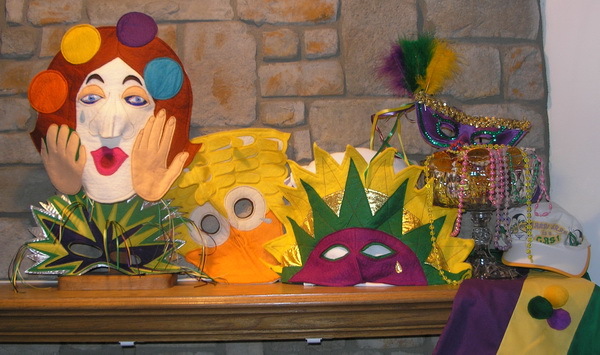 Bought the masks in New Orleans years ago and I love them, some of my throws, my hat and my Mardi Gras Throw bag (partially seen on far right with pom-poms). 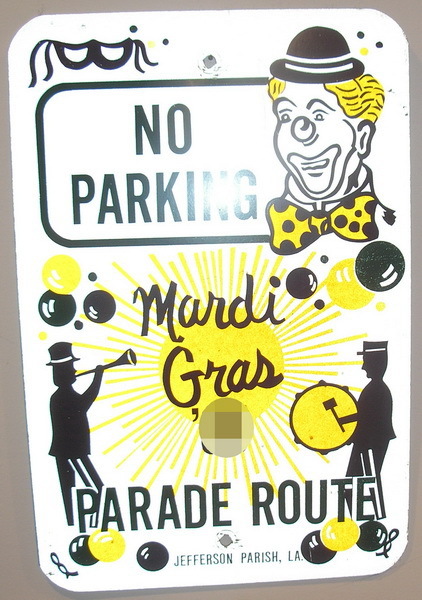 I even have a No Parking sign that the police chief of Meterie in Jefferson Parrish sent me, it hangs in my hallway year round.